Thanks to a suggestion I received, I decided to head to the Southhampton neighborhood to check out Grapeseed. Being a Friday night, I reserved my place in line with my favorite app., NoWait. I was able to hang out at home and then head to the restaurant to be seated as soon as I walked in the door. If you arrive and you aren’t willing to wait, you can snag a seat at the bar where you can still order all food items of the menu. As the name suggests, the restaurant features an extensive wine list and American style food made with seasonal, local ingredients. The majority of the menu is served as small plates ranging in price from $5-$16. There are also reasonably priced sandwiches and a small selection of entrees, several of which are gluten free. 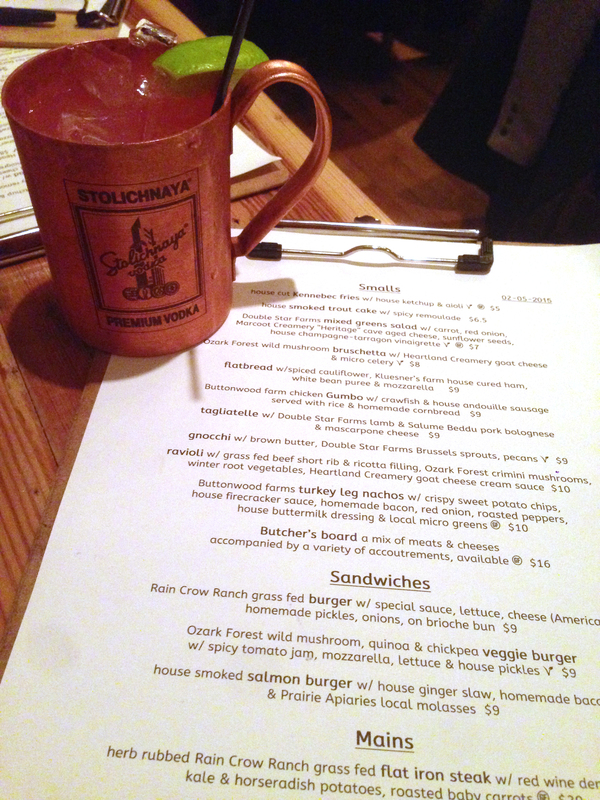 I started off with a Macklind Mule made with vodka, ginger beer, lime juice, and grapefruit bitters all served in a traditional copper cup. In addition to wine, there is a selection of local draft beer and a wider variety of bottled beer. Based on our waitress’s suggestion, we started with two small plates. First was the gnocchi made with brown butter, brussel sprouts, and pecans. I could have eaten this yummy dish for my dinner alone. I loved the subtle nutty flavor and crunch that the pecans added to the gnocchi. My only wish was that there would have been just a few more gnocchi (but maybe that is just because it was so delicious). Our second starter was the flatbread with spiced cauliflower, ham, white bean puree, and mozzarella. The cauliflower had a great cumin flavor with just a little kick to it and was cooked so that it had a nice crunch. This is a great dish to share and they were able to make half of it without ham to be more vegetarian friendly. I ordered the salmon burger with ginger slaw and molasses for my entree. I eat a lot of salmon burgers but this was easily the best one I have ever had. I love when salmon has a subtle sweetness and the molasses is what set this burger apart. The large burger was served on an incredibly fresh, simple bun and topped with the slaw which added a little texture. The burger did not come with any sides but fries were available as a small plate. Based on another recommendation from our waitress, my husband ordered the shrimp and cheddar grits topped with apple, pepper pesto, and bacon. The shrimp are served with the heads on which can be a little intimidating if you are not used to this. Although I do not love to see the face of food I am about to eat, my husband didn’t mind other than the little bit of extra work that it required. The grits were rich and creamy and this was the perfect dish for a cold winter night. 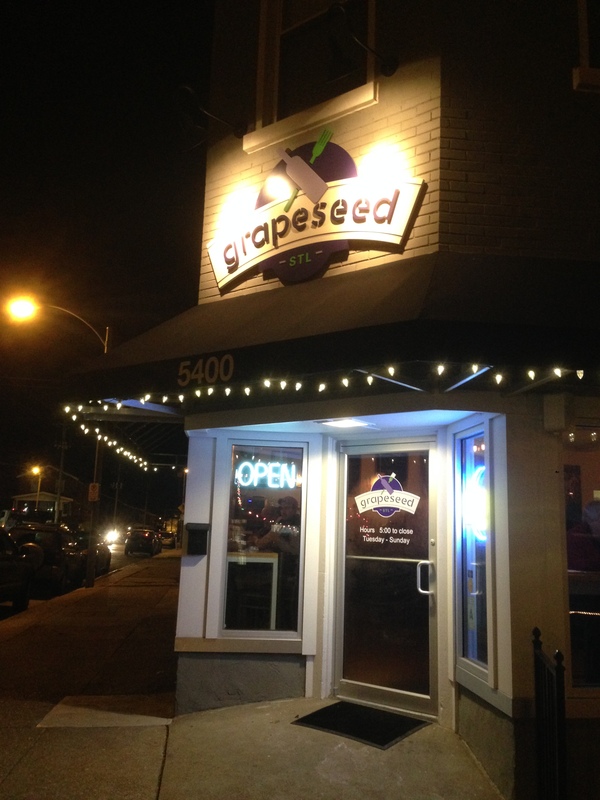 Grapeseed was packed the entire evening which leads me to my only complaint of the night. The restaurant is loud! Our server had to keep repeating herself and we had to shout just to hear across our 2 person table. That being said, with great food, reasonable prices, and a relaxed atmosphere, Grapeseed is everything you hope your neighborhood restaurant will be.